Rijdam Hardfacing Services, wij bestrijden slijtage! Rijdam hardfacing specializes in applying wear resistant materials to machine parts that are subject to wear. We find the right solution to your wear problem! In our workshop in Nieuwerkerk aan den IJssel, the wear resistant layers are applied with several welding methods, all with great attention to detail. Often used alloys, which are favorites of our customers, are the Cobalt, Nickel and Tungsten Carbide alloys. Up and coming are also the Iron carbide and Chromium carbide alloys, which can be found on our prefabricated wearplates. Tungsten is, next to diamond, one of the hardest substances on earth. Therefore, Tungsten is often used for its extreme wear resistant properties in alloys that are used for hardfacing. The alloys are often used in drills, mixer blads, transport augers and many applications where machine parts are in direct contact with raw substances. Technogenia specialized in tungsten carbides and developed a special HARDENED (spherical) tungsten carbide, the carbides have a hardness of +-3500 Vickers and are embeded in a tough matrix. This makes their alloys perfect solution to many abrasive wear problems. When it comes to wear, our opinion is: for every problem there's a suitable solution. Our way of working: Considering your wishes and the given information about application and problems, we will find the best alloy, the best welding method and the best life-time improvement for your machine. Custom solutions for the best results. Autogenous welding is suitable for most types of steel alloys. At Rijdam, we use autogenous welding for cladding of Cobalt and Tungsten Carbide alloys, and the extreme wear resistant alloys of Technogenia; Technodur® & Technosphere®. With our years and years of experience, we don't hesistate to take any job. Contact us and find out how we can help you! In this process, we melt a metal wire in a gas/oxygen flame and spray it using compressed air. The flame temperature is between 2,800 to 3,200ºC. This allows us to apply different metals and alloys. 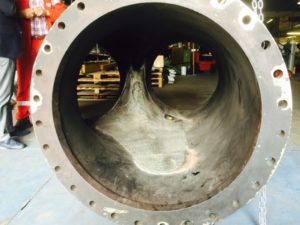 We often use this process for corrosion protection and repair purposes. We have carried this technique for many years and is one of Rijdam's specializations. The process has two stages, powder alloy is sprayed on with a flame gun and mixed by oxygen-acetylene mixture. In the process we use special Nickel, Cobalt and Tungsten carbide alloys that make will guarantee a thin, smooth layer of wear resistant material, metallurgically bound with the base material. The Lasercarb® process does not affect the carbide grains, which maintain their intrinsic qualities. The deposits are metallurgically welded to the base metal. They are also extremely dense, very precise and easily reproducible. Lasercarb coatings are used successfully in various industries, such as oil drilling, steel, papermaking, food processing and waste recycling. Plasma-transferred arc welding (PTA welding) is a thermal process for applying wear and corrosion resistant layers on surfaces of metallic materials. The highly energetic plasma arc melts the surface of the base material. At the same time, the powdery filler material is inserted into the arc and also molten. During solidification, a substance-to-substance bond between the filler material and the base material is created. The advantages of this process are a low dilution rate, a small heat-affected zone and a high deposition rate. The production of the powdery filler material is easier compared to similar welding wires and welding rods. Thus, many surface properties needed for special applications can be economically produced. This technique is often used at Rijdam to clad special Cobalt, Nickel, Iron and Tungsten carbide coatings, intended for this type of welding. Thin layers (0.35-6 mm) and low delution makes this process very suitable for turbine blades for example. Powder welding is often used in applying Nickel, Cobalt and (Tungsten) Carbide layers. The process is suitable for most steels, cast iron, and some Nickel and Cupper alloys. Powder welding has a relatively low process temperature and is very suitable for small surfaces, edges and angles, and cast iron. Low temperatures also ensures low dilution rates. Manual metal arc (MMA) welding is a welding process where the electric arc burns between a coated electrode and the workpiece. The electrode is fixed in an electrode holder and touches shortly the area that is to be joined. A short circuit is produced and the arc starts when lifting the electrode. During the welding process the electrode and its coating melt and slag develops above the weld seam. MMA welding can be applied in all welding position with th suited equipment and is an economic alternative since only few equipment is needed. The tungsten inert gas (TIG) welding is a fusion welding process. The material is not removed; instead both sides of theworkpiece that are to be joined are heated up until the materials melt and blends. After stiffening both sides are permanently connected. Depending on the welding task filler materials can additionally be used for joining. With the suited equipment TIG welding is suitable for the joining of almost all materials that can be melted, ideally for welding tasks in root and constrained positions.The process is ideal for small components because it offers high control on heat input and positioning of the arc and the welding layer. TIG has the advantage that it can be automated. MIG is excellent for cobalt, nickel and iron alloys, tungsten is also possible but the temperature has to be well regulated.